Hello gallery fans – I’ve moved this blog over to the gallery website but wasn’t able to move over the subscribers. So if you subscribed here, and would like to continue receiving notice of my (very sporadic) posts about artists and exhibits at Abecedarian, you will need to head on over to the new blog home and resubscribe. 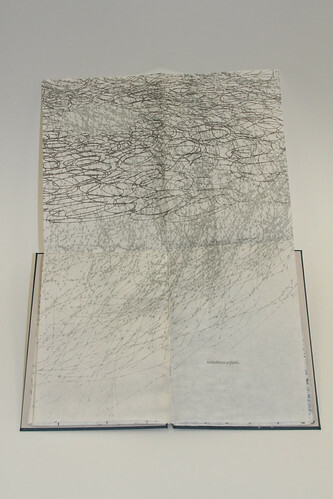 Family Tree is a 2013 publication by California book artist Julie Chen, published in an addition of 50 copies. Production will begin in February; pre-production orders can be placed by contacting Abecedarian Gallery. The publication is a set of 16 two inch cubes, housed in a drop spine box. Some surfaces are digitally presented and others laser engraved. The set presents six variations on a single image. The cubes rest in the box tray with adequate space above the tray edge for removal of individual cubes. Thus the cubes can easily be rearranged and rotated in a variety of configurations, either within or outside of the box tray. Six of the arrangements present variations on a single image, an image of shadows cast by tree branches on a sidewalk. The book arrives arranged with a photographically rendered image of the shadows and a brief text, the baseline of the text following the shapes made by the shadowy forms. The same arrangement of cubes flipped over 180° reveals a negative image of the same photograph of tree branch shadows and presents a different text. Two of the remaining cube sides are one or two word phrases with simplified tree shapes floating behind the words. The negative space is etched into the wood block, the positive space is raised and inked and looks like an inked wood block ready for printing. One side of each cube is inked in orange, the opposite side in turquoise. I appreciate the sense this gives of a work in progress, as the piece as a whole, regardless of the state it is in, will always be in a state of progression from one version to the next. As with the histories the work focuses on, we always arrive somewhere in the middle of the narrative, and by re-arranging the blocks, can continuously shift the emphasis of the narrative. The remaining two sides are graphic representations of the shadows, printed in a palette of bright colors that are grayed down enough so that they aren’t jarring or garish. The insides of both the top and bottom trays have visual ‘keys’ so that one can arrange the blocks in the order that presents an uninterrupted image. These are but a few examples of the multiple arrangements (a set of 16 cubes has a possible trillion combinations). The book was generated using cards drawn from the Ideation Card Deck (also available for purchase at Abecedarian Gallery) and included in the exhibition Ideation by Chance (click here to see online catalog of the exhibit) curated by Julie Chen. 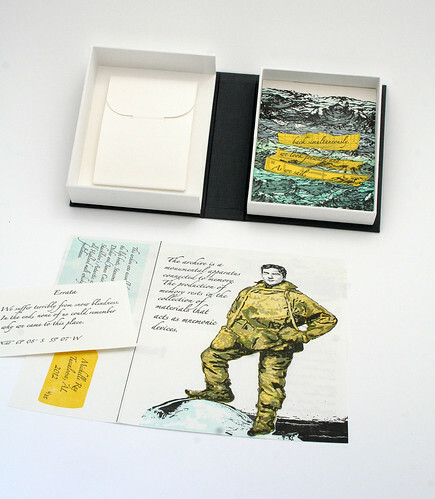 Each year, an artist is selected from the Artists’ Book Cornucopia exhibit for an exhibition award. Past recipient’s of this award include Casey Gardner (2012), Lise Melhorn-Boe (2011) and Sarah Vogel (2010). I am pleased this year to announce that Michelle Ray is the recipient of the Artists’ Book Cornucopia IV Gallery Director’s Exhibition Award. Her work will be featured in a solo Reading Room exhibition April 18 – June 7, 2014. Michelle’s work has been included in several group exhibitions at Abecedarian, and most of her available work is in inventory at the gallery. Last year Michelle was awarded an MFA from the Book Arts Program at the University of Alabama at Tuscaloosa. The consistent quality of the work I see coming out of that program is worthy of comment. Graduates of this program invariably produce work that is beautifully crafted, rich in content and effectively balances concept and content through thoughtful presentation and structure choices. Of the many graduates from that program represented by Abecedarian Gallery, Michelle Ray has been among my favorites since my first viewing of her book The Kashash and the Archivist. Much as enjoyed showing and placing this book, I was a bit bereft when it sold out. I had the luxury of musing over it countless times while it was in inventory, and found it warmly rewarding to introduce this book, along with other Ray titles, to my clients. I have continued to ponder its impact on me and have concluded that this title, along with several others Michelle has produced during her brief time in the book arts, remind me of the writing style of Annie Dillard. Annie Dillard with images. High praise indeed. Ray has just finished up a residency at the Small Craft Advisory Press (a remarkable book arts/printing residency program affiliated with in Florida State University in Tallahasee), where she produced God Created the Sea and Painted it Blue so We’d Feel Good on it. I look forward to exhibiting her work next year. Today’s post features three books that utilize folding techniques to create forms that carry content or even become the primary content of the book. The wrap-around case that holds Kimberly Maher’s pop-up carousel book Crooked is fairly plain-Jane except for an angled flap on the front cover. The coolish gray of the cover and use of a hidden closure (magnets) quietly beckon as I lift the angled flap with anticipation. Carousel books often shine most brightly when displayed upright and fully open; happily Crooked also reads very well flat, as a ‘bookie book,’ allowing for a more focused and leisurely pace through the book than is feasible when displayed upright. 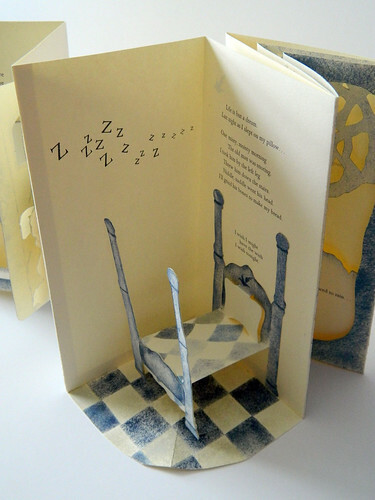 The text and imagery, printed pochoir and letterpress in a limited palette of blues and grays, move from outside (a stormy wind illustrated by a swirling funnel cloud that, affixed to both sides of the spread, rises as the page is turned), to interior domestic spaces with stairs in the second spread and a pop-up four-poster bed in the fourth. My favorite spread is the center spread with its grandfather clock on the left page. Rather than popping up or opening, the clock swells into a sweet curve as the page is turned. The other side of that spread features a door opening to reveal both text and pop up image. 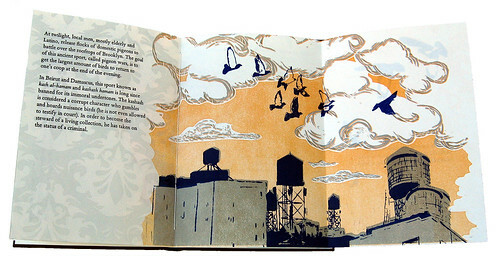 The last page takes me back outside again, to the garden, and is a two-layer spread. Crooked also displays well. What I first notice on setting it for display as how nicely the angle of the cover flap mimics the angle of the interior pages. to entice the viewer into a false sense of pacification by subtly revealing a much darker illusion she examines defense mechanisms-notions of escape, breaking free from restraints or oppression. 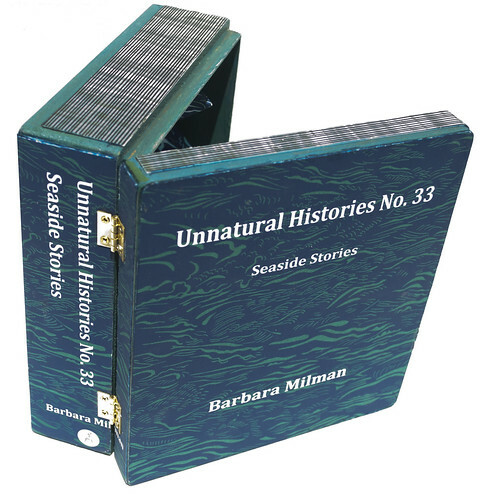 Barbara Milman’s piece Unnatural Histories #33 – Seaside Stories uses folds to create shapes that not only carry imagery, but also become specific and non-interactive shapes, held static in this case. Although the viewer isn’t able to move the pages, there is still a sensation of motion, created by graphics and forms that repeat in a way that mimics the ebb and flow of the ocean. 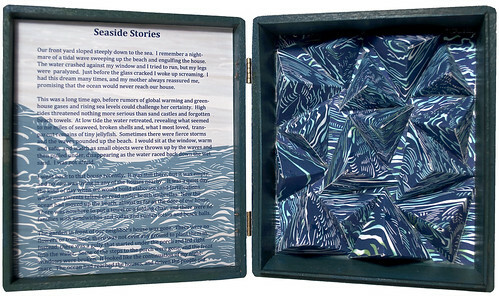 Milman’s receiving a gift of several cigar boxes prompted the creation of this series; this particular piece has a one page text related to climate change affixed to the inner front cover; the wave forms are on the boxes deeper, right side. 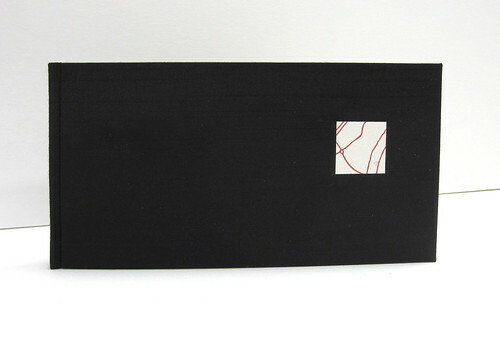 Suzanne Sawyer’s To Make You See is a single sheet Turkish Fold housed in an elegant black cloth case binding. A square label of sorts is on the front cover, although the label doesn’t have an actual title. The label instead has a few ghostly and randomly placed letters amid intersecting red lines. Once open, the orientation is appropriate for reading both the colophon and a brief historical snippet about Al-Mutanabbi Street. To read the rest of the textual content it is easiest to rotate the piece ninety degrees. Three quotes, one by Joseph Conrad and two by Lucius Annaeus, Seneca are laid out in various sizes; Conrad’s quote is in larger, and darker type. The words To Make You See, along with intersecting gray lines (a map of Baghdad), form a backdrop for the quotes. With very little text, this piece provides historical context alongside well chosen quotes. I was familiar with the words of Joseph Conrad, remarking on the power of the written word, but not with the words of Seneca. Seneca’s quotes strike a nice balance, including words about mankind’s search for meaning and a method for finding inner peace. Rare is the book that doesn’t rely on folds; there are the utilitarian folds of the codex bound book, the over-the-top magic of flexagons and magic-wallets, the accordion so well suited for display books, pop-ups, pullouts, map folds – the list is a long one. This post features two artists – Sammy Seung-min Lee and Joshua Orr, whose works incorporate thoughtful use of the fold as a way to marry concept and content. 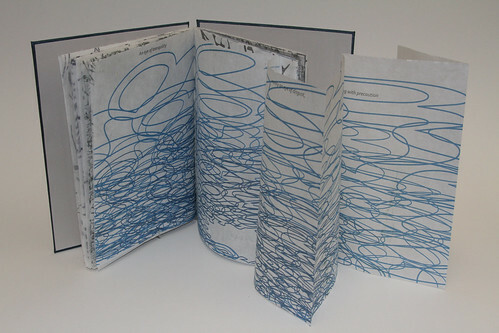 Before even opening three Three Willows Bindery by Sammy Seung-min Lee I suspect I will be captivated. Rather than being bound on the left, the book is opened by flipping the pages up towards the top edge, bound using this an exposed spine coptic stitch. The skewed and asymmetrical shape of the book hints at architectural content as the graphic depicts an aerial landscape view. The graphic is of raised shapes cut from material (printed paper?) that has an embossed wood grain, a lighter tone of brown than the surface underneath. When viewed from either side there is physical topography created by mountains and valleys of pleated paper. When I do open the book, the stage is set. I know I am entering a specific environment. To create a virtually wordless work that tells a tale of a specific time and place in a way that engages an uninformed audience using shapes, both physical and visual, images both photographic and graphic and color, but no words, is not an easy task. Lee has achieved a successful balance between over simplification and complexity. The book is comprised of three different types of geometric pages, varying in shape and size. The pages’ contents can expand and interact in multiple permutations based on their folds, much like a map can be refolded in various ways. The pleats of the pages also resemble the topography of the land: the overall shape of the book mirrors the site. Deluge is a slim, lightweight volume housed in the three sided box. 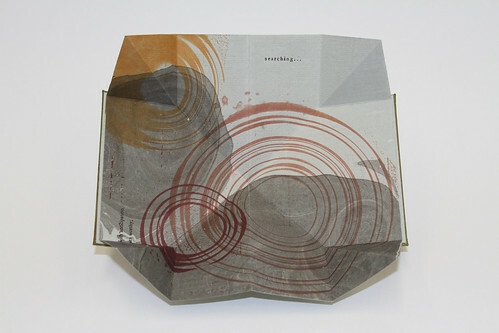 On first examination the book presents as an assortment of printed shapes, in cool tones on lightweight folded sheets. With each turning of the page there are new patterns and combinations of patterns to consider. Closer examination reveals a very tidily placed textual narrative. To access the narrative requires more interaction with the individual pages. For example a page folded in quarters is sewn in, the top half can be lifted, exposing the other side of the printed sheet. To read the phrase “tides move and swell” requires lifting the folded page towards the top edge of the book to access (thus moving the page and swelling its size). Just as I settle in to the predictable rhythm of turning a page and lifting it to access the next phrase, the format shifts to folded page that extends horizontally. At about this same point in the book the imagery is decidedly more complex and chaotic with more of the page surface covered with marks that appear in two colors rather than one. The final graphic is of flattened spiral shapes trapped behind a rectangular grid that reads as a barrier, or fence. The book has a flow that brings to mind The Beaufort Scale, an empirical measure that relates wind speed to observed conditions at sea or on land. The slow pace of reading the text combined with the use of lightweight papers, muted colors in neutral tones that do not shout loudly or distract are a striking and effective contradiction to the agony presented in the text. Orr’s attention to detail in Shifting starts with the case, a shimmery duotone green and gold cloth (yet another work without a label on the outside . . . Is this a trend?). A livelier green tone paper chemise is bound into the case and houses the book itself. The placement of the colophon on the outer case means I am privy to production details before I open the book itself. Thumb slots make pulling the book out of the chemise an easy and enjoyable task. The front cover of the book is indicated by a circular graphic surrounded by speckles, printed golden brown. This graphic is repeated in other earthy tones and various sizes inside the book itself, which consists solely of a single sheet, folded Turkish map style. Pithy and quiet, the entire text totals seven words. No more are needed; the project is a complete presentation of what is evidently a personal exploration of domestic realities. I find Shifting compelling in that lacks a strong and obvious point of view. I have returned to its quiet homily again and again throughout the exhibition. The gift of a work like this is that is triggers a state of mind without expectation that my state of mind reflects or mimics that of Orr. Contact the gallery to inquire about availability of these titles. Three of the books in this years’ Cornucopia are particularly rewarding haptically. All three are one-of-a-kind books relying on touch to be fully appreciated.Sadly few of you blog readers will be able to personally delight in the sensuousness of these works. Even so, I hope you enjoy reading about the works of Servane Briand, Elizabeth Holster and Beata Wehr. More details about all three can be found in the online catalog. Touching the outside covers of Servane Briand’s déchirures (made from a cashmere sweater) is comforting in the way that stroking a cat can be comforting.This indeed is one of her intentions – to make a book that is ‘comfy’ on the outside, with spiky content within. Briand introduces another kind of soft to the book’s covers with laid on bits of Kozo paper, torn at the edges and printed with a series of words that reference the book’s interior contents. Bigger lumps take the form of embroidered shapes. The back cover is solid softness. Torn paper edges peek out from the head and tail edges in a pleasing repetition of what the torn paper edges on the cover. Upon opening an 8 panel accordion is revealed, each panel, including end panels, with a printed image of something spiky from Briand’s current geography, California. Included are images of sharp edge pinecones, various cacti, the pointy bark of a palm tree’s trunk. I appreciate an artists’ giving consideration to the back side of accordion books and this Briand has done with a composition of vertical, straight edge strips of kozo printed with layers of text and purply red unryu, simulating the red of gashes in the skin. 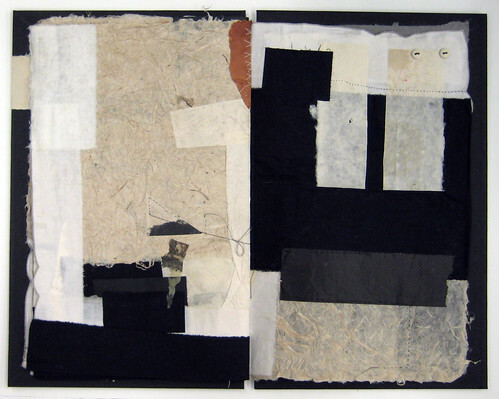 The compositions work both as individual panels and when the entire text block is unfolded (to a length of 40 inches). A horizontal band of text spans the three right panels, tidily placed in the bottom fifth of the panels. The text gives the reader a few factoids about the Cactus family. I learn (or am reminded of something I suspect I learned at some point in school) that the spines Cacti not only defend but provide shade that lowers the plant’s water loss through transpiration. Déchirures was born in translation! I was amused by the term “softcover” and intrigued by the emphasis that exists in the American publishing world bewteen “hardover” and “softcover”. I started to work on a series which is a “jeu de mots” on the French translation of “softcover,” a reflection on the wider use of softbinding in France — even for first editions — and a statement on the invaluable feedback we get from touching a book (something lost in digital editions). Quite different from the soft comfiness of Briand’s use of a cashmere sweater is Beata Wehr’s Blue Book About the Past.The book is housed in a blue canvas pouch with fold over flap. The pouch is encrusted with paint and texture, its surfaces appear pebbly and rough and also reminds me of the pock-marked images of lunar scapes, but in bright and beautiful variations of cobalt and cerulean blues. My eyes have not deceived, the surface is rough to the touch, the protrusions unyielding and nearly as abrasive as coarse sandpaper. The book itself has artifacts that, taken out of context, could be from some distant, unknown land. Closer examination renders the objects more familiar – bits of rusty metal and wire, 35 mm sections of film stitched in place through the sprocket holes, broken off metal keys, spiky organic bits that I later learn are agave thorns, arrayed in vertical compositions through the 4 pages and on the covers of the pamphlet sewn text block. I especially appreciate that the stitch lines are left exposed on the back of each page so that a page spread shows the patterns of the stitch lines on the left, with objects stitched into place on the right. Mechanically simple, the pages turn well and lay flat when asked to. The challenge of working with additive objects that have bulk that is met well in this book. The pages of this book are made out of old painting cut in pieces. I stitched to them three kinds of objects: old slides of my artist’s books, agave thorns from the desert I live at now and found metal pieces, whose history is unknown to me. All of them speak about time and transience and create short stories on every other page. The cover of Elizabeth Holster’s book, Black and White, resembles a portfolio; the only surface treatment strips of mulberry, one each front and back. On opening, I am pleased to discover a work with page spreads that bring to mind the oversize coffee table monographs; the ones with full bleed images running across the entire spread; the clutter of explanatory text appearing elsewhere in the tome. Each of the 7 page spreads, that include both pastedowns, is a skillful composition of mostly solid (i.e. not patterned or very subtly patterned), neutrally toned geometric shapes. The shapes are a combination of various papers, fabrics, buttons and leathers, some held in place with tidily accomplished hand stitching, some cut, others torn. What is exciting about this book is the abundance of shape and texture accomplished with a very basic set of materials. Details such as the overstitched scalloped hem of a piece of fabric, or the slightly skewed placement of shapes are not fussy additions but rather thoughtful contributions to the overall image. explores the idea that while we tend to talk about things as either / or, in reality there are a host of variations between black and white. In fact, although muted and subdued, the palette of the book is many steps removed from black, white and gray. While on display at the gallery, I have given myself the treat of turning the page at the end of the day, so the first glance at this book (placed flat and opened on a low pedestal) the following day seems fresh and new. I do wish there were more pages. This year’s Artists’ Book Cornucopia features three works that fall into the 3 inches or less US standard for miniature books. All are editioned works and all three utilize an accordion format. All are well crafted and feature content that fits their diminutive size well. I hope you enjoy reading about Louisa Boyd’s Stardust, Jessica Spring’s Inflammatory Guide . . . and Sun Young Kang’s Memories Unfolded as much as I’ve enjoyed having a chance to examine and remark on them. Louisa Boyd’s Stardust is housed in a black cloth clamshell, sans label. The fit is snug. 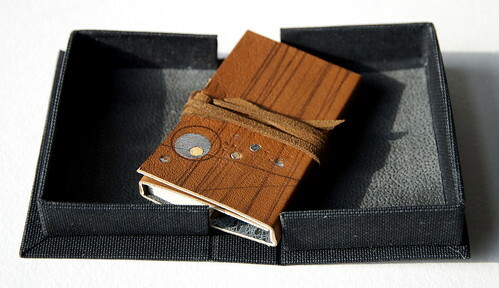 The book is wrapped in a brown leather wrapper with hand-applied crayon lines, leather dots and metal foil. The top most panel has a series of vertical, but not exactly parallel lines that, on first glance, look like wood grain. Two cross-directional lines, also slightly angled, begin on the cover and wrap all the way around the wrapper. The bottom third of the panel is additionally adorned with silver foil and leather circles. The wrapper is held closed with a leather thong that is a bit too long and unfortunately detracts from this otherwise refined miniature. Stardust’s riches are made apparent when the wrapper is fully opened. The interior lining mimics photographs of earth masses on planets viewed from space and is also slightly corpuscular. These shapes, printed in orange over cool black, are overlaid with gray markings that emulate celestial maps. The text block itself is a concertina. One side has surface applied markings in rust, ochre and black, a landscape of sorts, with spiraling masses above the tree dotted horizon. Above the horizon line holes of varying sizes are punched throughout the text panels. The back side of the concertina is not imaged, but the punched holes create a pared down version of the front side image. Because the concertina is only half the width when folded of the wrapper that contains it it is possible to see both the text’s imagery and the wrapper liner’s imagery simultaneously. I find this very appealing. Stardust is part of a series of work that considers themes of infinity, mortality and the journey of the human soul and spirit. 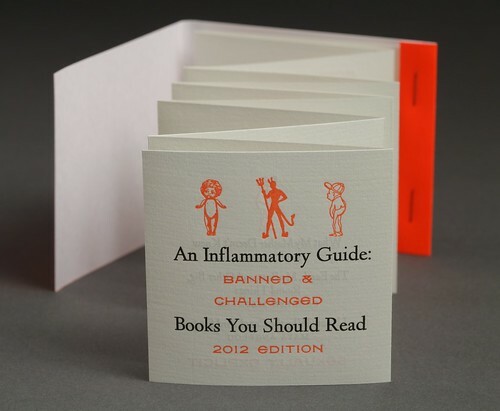 The small but assertive An Inflammatory Guide: Banned & Challenged Books You Should Read by Jessica Spring shouts out with a fluorescent, hurt the eye orange cover that mimics a match book cover. This book also does not have the title on the cover but instead has the directive ‘open mind before striking’. 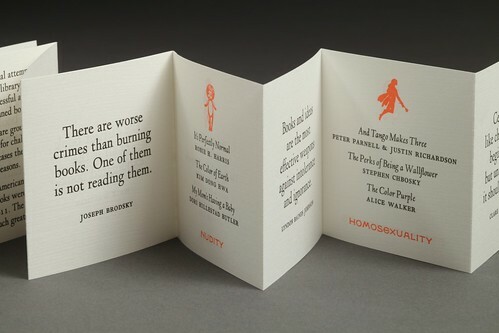 The accordion fold book uses every available panel to present quotes from a variety of sources, alternating with lists of titles printed in black ink, with their offense printed in orange. So we learn that Huxley’s Brave New World, Alexie’s The Absoluteley True Diary of a Part-Time Indian and Lee’s To Kill a Mockingbird are among the most challenged books of 2011 – the reason? Racism. The case for Memories Unfolded is unusual. The back piece has a back cover, spine piece and front tab that is only half the width of the text block. The front cover is attached only to the text block, and not the rest of the cover. This design allows the book to have the protection of a case binding at the spine, but still allows the spine to be exposed after opening. It also creates an opportunity for more than one loop closure at the front; one holds the front edge closed, the other holds the spine piece in place. The placement of the ‘button’ part of the closure, made of a spiral of dark brown linen cord, mimics the placement of a door handle. The front cover of the book along with the partial tab, has paper cutout images of traditional Korean doors. 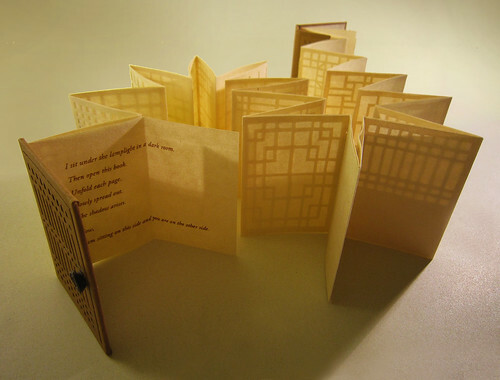 I have created this shadow book with paper-cut-out images of Korean traditional doors. The process of cutting the pattern of the doors to create shadows recalls my memories of my grandmother in her old house. When I was inside, I could see the shadow of Grandmother cast on the paper doors from out side. Grandmother’s presence as a shadow on the door has remained a strong image in my mind. Unlike many other doors, the traditional rice paper door does not totally block the inside and out from each other. It only creates the concept of this side and the other while simultaneously connecting them to each other. 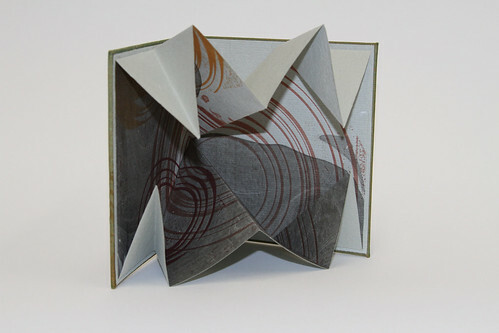 When this accordion book is unfolded, the pages are shaped as closed, connecting the memories of my Grandmother, who is now in the other side, with myself in this world. When open and fully extended the duo layer pages present a variety of traditional door patterns, cut out and backed with paper that is somewhere between transparent and opaque. In low light, the patterns are subtle, with stronger lights, the lines of the doors cast shadows. Kang’s work often focuses on the endless circulation of life, in this case she uses light creating shadow as metaphor for life creating death. 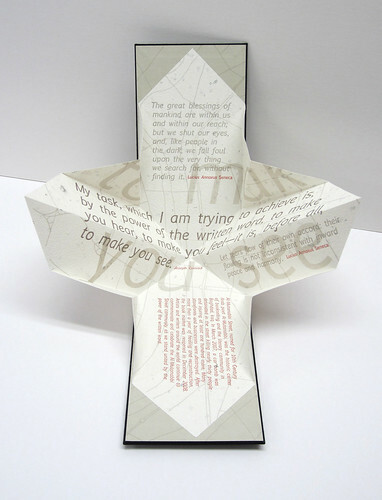 Her text, minimal and perfect, is revealed when a single folded panel is opened. Death is not the end, but the other side of life and a part of it. The lost come back as a memory. Each story, the fragments of memory, is spread out on this screen. The screen is a metaphor of the inseparability of life and death. Light from one side casts a shadow on the other, just as life, this world is inseparable from death, the world beyond.